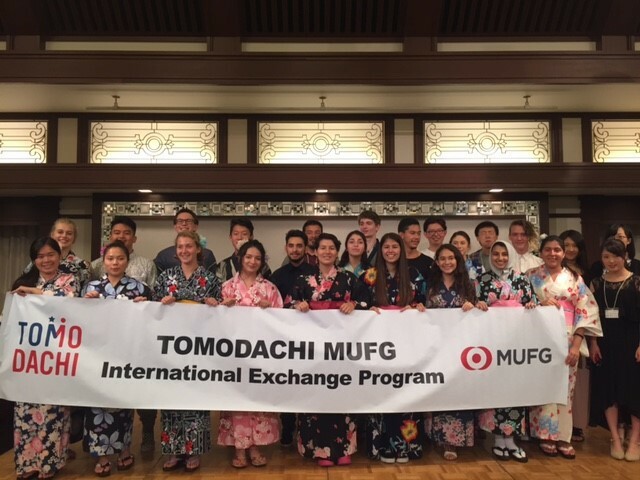 The TOMODACHI Initiative and Mitsubishi UFJ Financial Group (MUFG) are recruiting American high school students to participate in the 8th TOMODACHI MUFG International Exchange Program! The program was established in 2012 with the goal of deepening the mutual understanding between the United States and Japan and investing in the next generation of leaders. This is the eighth year of this exchange program, in which students from both countries are sent to the United States and Japan alternately. For this year’s program, students enrolled in high schools in Los Angeles, Orange, San Diego, San Bernardino, or River Side Counties will be eligible to participate in the 8th TOMODACHI MUFG International Exchange Program. This program will send selected students to Japan for a two-week program from Saturday, June 22 to Sunday, July 7, 2019. During the program, the students will have opportunities to learn about Japanese society and culture, the challenges of creating a sustainable society, and leadership though visits to Tokyo, Hiroshima, and areas in the Tohoku region recovering from the Great East Japan Earthquake and Tsunami, as well as various exchange activities. The program features extensive opportunities to meet with Japanese people through homestays, social activities, and interactions with local high school students. The 8th TOMODACHI MUFG International Exchange Program is hosted by the U.S.-Japan Council and supported by the Mitsubishi UJF Financial Group Inc. It is implemented by the Japanese Association of the Experiment in International Living (EIL) and recruitment is administered by the Japan America Society of Southern California (JASSC). For application information and 2019 program details, click here.